I bet there aren’t too many children who are looking forward to starting school again in a week or so. The long holidays are almost over and it always used to seem to me that the days went faster the closer to September we got - and I think small daughter feels the same! It’s going to be a bit different in our house this year as big daughter starts university at the end of September so she still has time off, and the whole experience will be quite unlike being at school. It’s an exciting time, and small daughter – although she still has quite a few years to go before she can leave school – has been caught up in the conversations as if she’s off to university as well. Although she has picked her degree course, big daughter is still deciding exactly which career route she wants to choose. Small daughter has everything mapped out. She’s going to be the Prime Minister, which she’ll fit in around her New York fashion house and her Parisian restaurant. In her spare time, she’s going to be a competitor at the next Olympic Games (although she can’t quite decide in which sport) and win The X Factor and Britain’s Got Talent. She sees no reason at all why she can’t do any or all of these things, and although we will help her to steer her ambitions to make them as achievable as possible, who are we to say that she won’t be any or all of those things? The sky is the limit as far as she is concerned, and that’s the joy of children. They can be anything they want to be and although “real life” sometimes gets in the way and their ambitions don’t work out quite as they had planned as they grow up, sometimes it’s enough just to try. Who gives us the right to decide that they will or won’t be good at anything they put their mind to and to put them off before they’ve even started? Who had the right to tell us that we weren’t any good at the things that we now have hang-ups about? If we were enjoying ourselves, what does it matter if we didn’t get the gold medal or we changed our minds and chose to do something else with our lives? 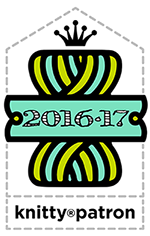 The end of the summer holidays and the return to school always feels to me like a new year just as much as the “official” one in January. It’s a time to shake the sand off our feet and take up something new as the summer fades and the winter edges closer. It’s an opportunity to fill those dark evenings with new skills and learning, to discover something else about our lives, our planet and ourselves. It’s time to forget those who might have dampened our childhood ambitions and do something that suits us now. The sky is the limit for us as well. I don't know what it is about the summer holidays this year but I'm finding them a bit disconcerting. I don't seem to be able to keep a grip on what day it is for one thing - every day feels like a Saturday which is great in one respect but too many Saturdays are starting to feel a bit peculiar. I'm used to my days being organised around school runs and dog walks and at the moment they aren't. I'm thoroughly enjoying not having to be up early and rushing around, watching the clock hands move with alarming speed from "on time" to "late", but it's also making me quite lethargic and I could happily spend the days doing very little at all. We've done some out-and-about-ing and some pyjama day-ing and now we're up to the clearing-out-ing which small daughter in particular is resisting quite spectacularly. I don't blame her, really; school holidays are meant to be fun, not for clearing out your bedroom (or the garage or the attic) but the amount of stuff that seems to have accumulated recently is feeling quite claustrophobic and Something Needs to be Done. On the positive side, small daughter has found all kinds of treasures in her room that she thought were lost forever - but the downside is that now she doesn't want to part with any of them and by some kind of alchemy the amount of stuff that she owns seems to have grown to the point where there's hardly any room for her even though all she's done is opened a few drawers. I'm hoping this is just the bit where it gets worse before it gets better! It's not all lazy news, though. I have managed to stir myself to get some things finished and I'm ahead of the game with the Yarndale Sock Line socks this year. 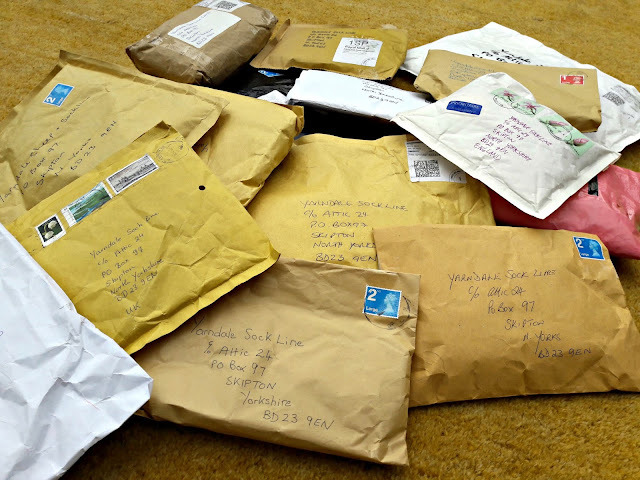 Last year, I went to collect them from Lucy at the beginning of September and we had a wonderful morning opening all the parcels (you can read about that here). 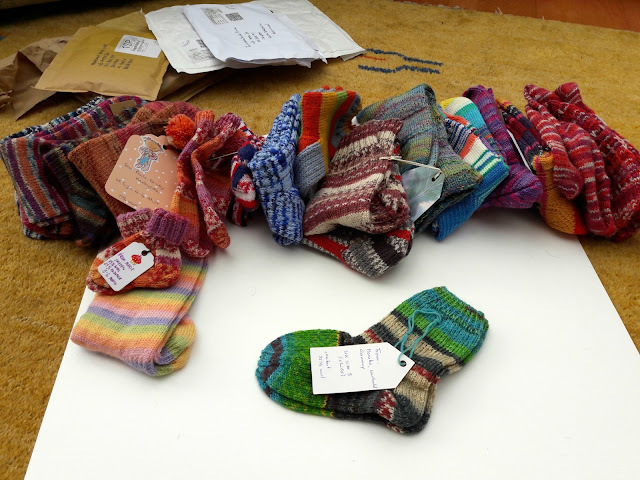 I couldn't believe how generous people had been with their time and their yarn, knitting socks to send from all over the world to be hung up on the Sock Line and then gifted. 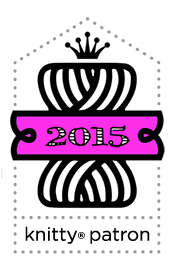 Already, I can see that this year won't be any different. I've been able to collect the parcels from Lucy pretty much as they come in this year so that I can get them catalogued and up on Pinterest for everyone to admire a bit earlier. And admire them I am sure you all will - once again, people have been so kind and generous with their woolly gifts and I know that they are going to be very gratefully received. I like to take my time to properly look at every pair, to see the time and care that has been spent on something that's going to be given to a stranger. Each pair, to me, feels like a smile and a hug wrapped up in yarn and it's a joy and an honour to be part of the process. Thank you so much to everyone who has sent socks so far, whether they're here with me in Winwick, waiting patiently in Skipton or somewhere in the post! 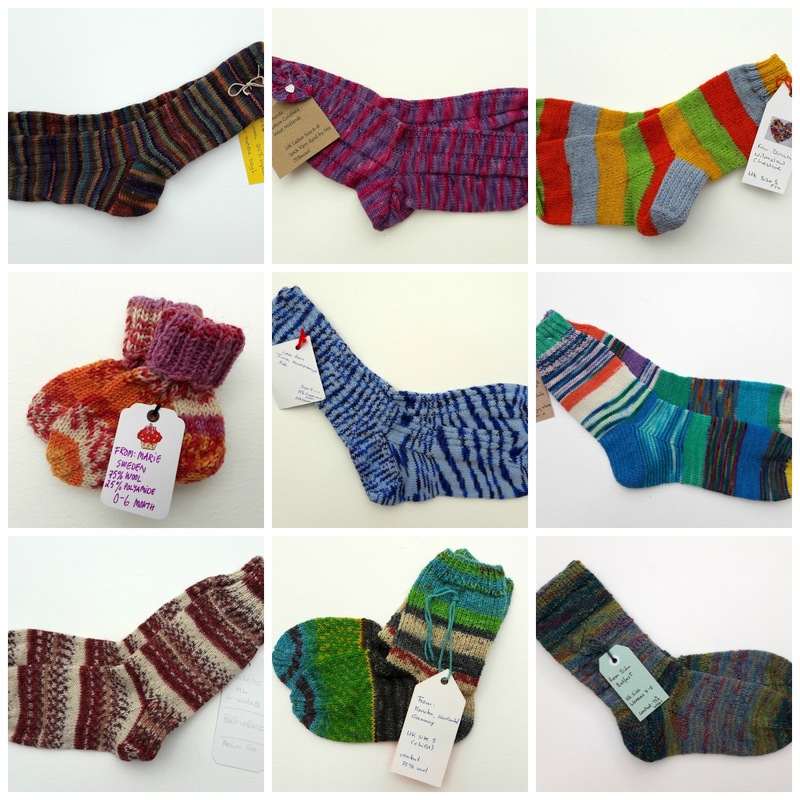 The first of the socks are up on Pinterest now - you can find the page here - and I'll be adding more pairs as they come in. I think it looks brilliant to be able to see them all together, and I will of course be telling you where all the socks are donated so that you can see where your pair has gone to brighten up someone's day. You can see where last year's pairs went here, and if you've got any suggestions for where this year's pairs might be welcome, then do let me know! I've finished my own contribution to the Yarndale Sock Line but haven't put the label on yet so I need to get on and do that so they can be put away safely with the others. 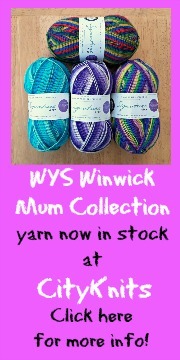 These are knitted in West Yorkshire Spinners Signature 4ply in Tequila Sunrise. The colours make me think of ice lollies which is always a happy thought for me, so I hope someone else thinks so too! I've made a start on my Yarndale sheep - currently in flat pack form - and I'm hoping to get that finished before the weekend. 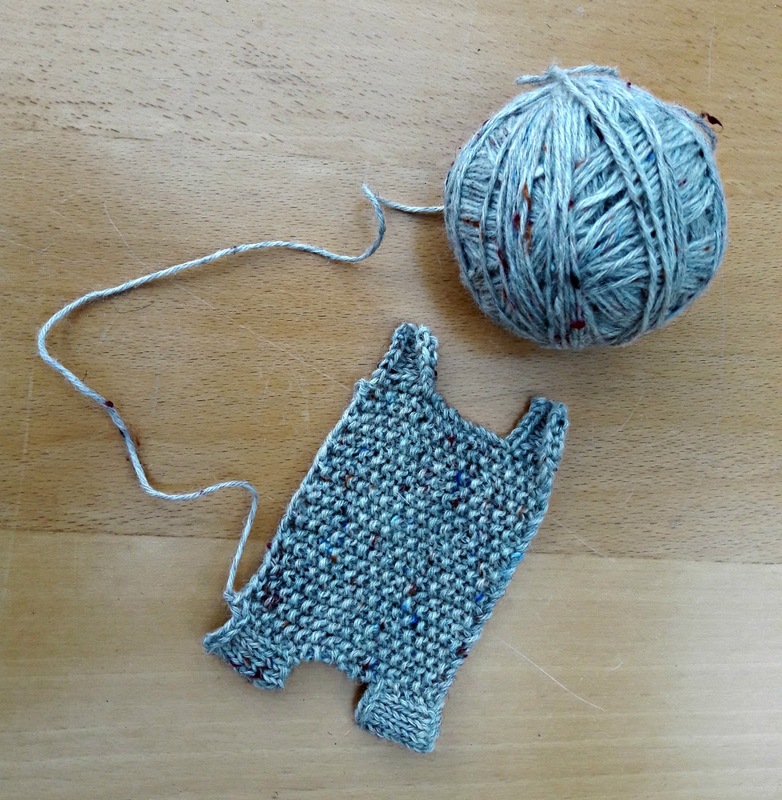 It's a really quick knit (or it would be if I didn't keep getting distracted by other projects ...). You can find the post about the Yarndale sheep and the pattern if you want to get involved here - there's a knit and a crochet version so there's lots of opportunity to use up some of your leftovers to increase the flock! 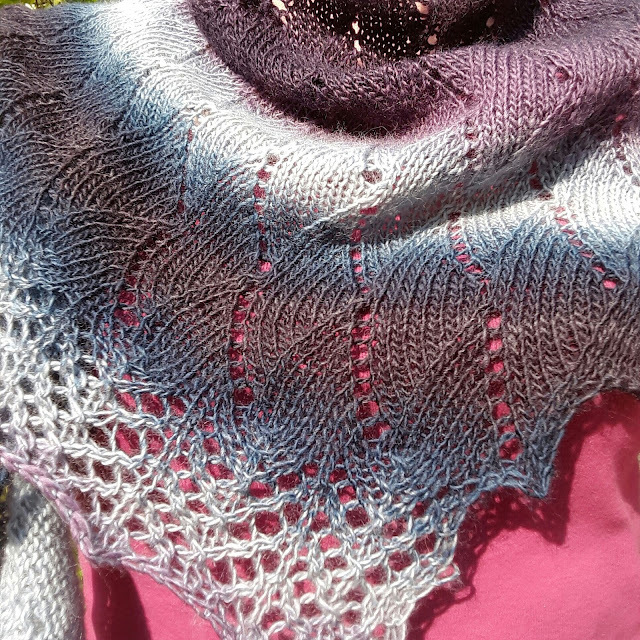 I've also finished my Exmoor shawl which I'm very pleased with. The colours blend from deep purple through blues to silver and back again - this yarn would have driven me mad if I'd tried to make socks with it, but it's just perfect for a shawl. One of my favourite moments with shawl knitting is blocking when you can see the colours and the shape beautifully (even if the old towel that it's blocking on isn't the most attractive!). When I came to the end of the pattern, I still had quite a lot of yarn left and although I had hoped that I would be able to finish with the purple, I was at the cast off point at the silver colour. 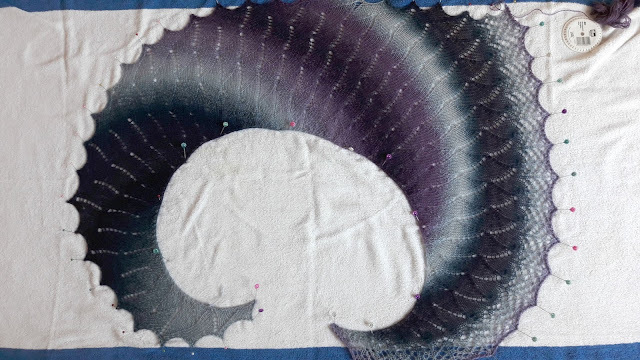 I was extremely pleased with myself for managing to work out how to extend the border so that I could use up a bit more yarn and cast off with purple. I'm no maths whizz so at first the thought of working out changes to a lace pattern seemed like something quite unattainable, but with the help of some graph paper and coloured crayons, I got there in the end. It just shows what you can do sometimes when you sit down and think about it! We've still got two weeks of the holidays left and small daughter's sterling efforts in her bedroom yesterday, a few boxes less in the attic and a trip to the charity shop mean that we all feel much less cluttered and we're going to make the most of the rest of the the summer break. It feels like a weight has been lifted! 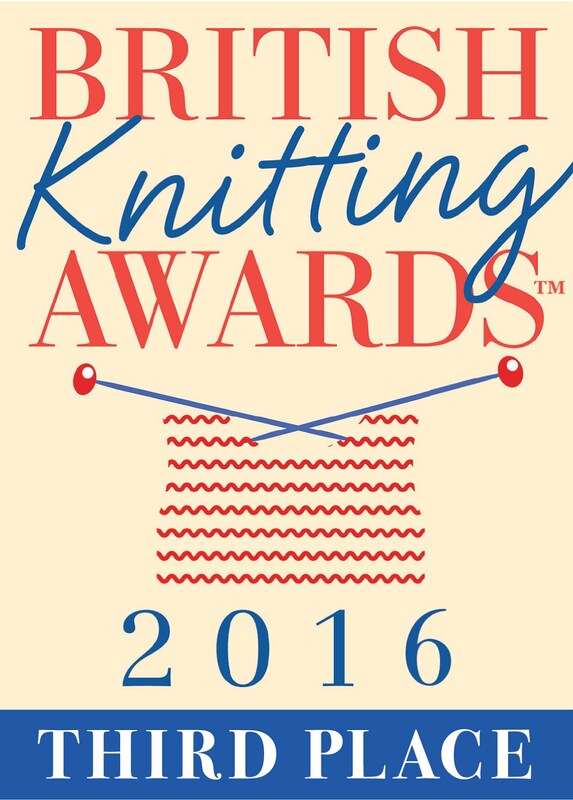 Finally, before I go off and do something else today, I hope you won't mind if I remind you about the British Knitting Awards. 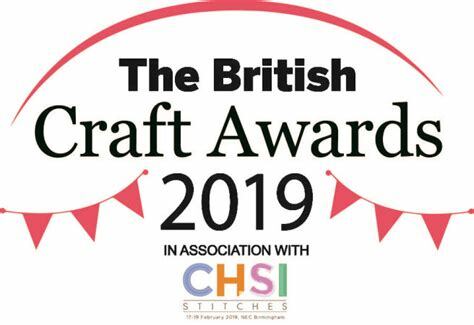 I was delighted to be nominated for these industry awards earlier this year and the voting closes on 28 August. 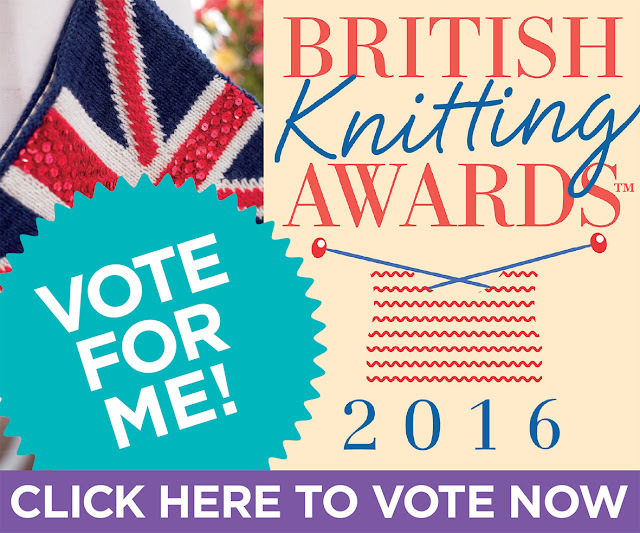 If you live in the UK and you would like to vote for me (and I would love it if you did!) 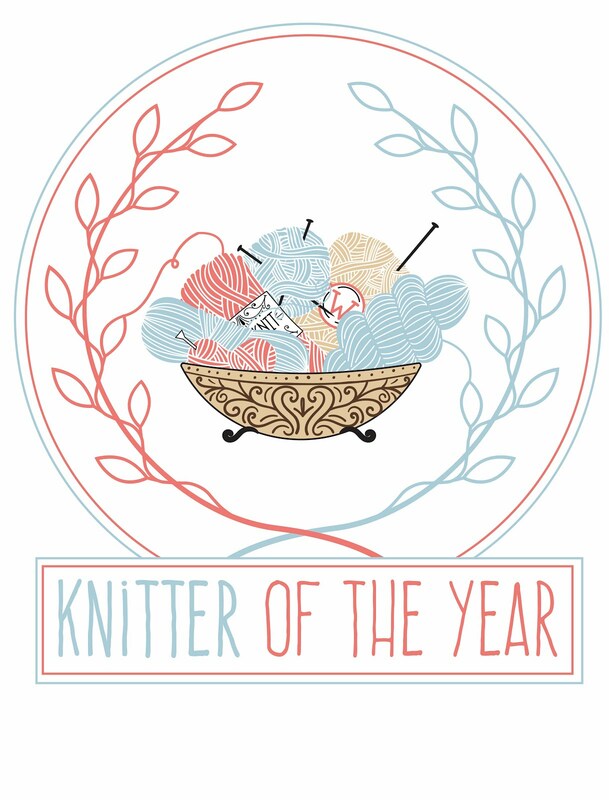 then I'm in the Favourite Book and Favourite Knitting Blog categories, and you can be in with a chance to win a spa break or a rather hefty yarn bundle simply by voting. You can get through to the voting page by clicking on the picture below - and thank you! I very much appreciate all your support! Hiya, it’s Big Daughter again - back from my travels! 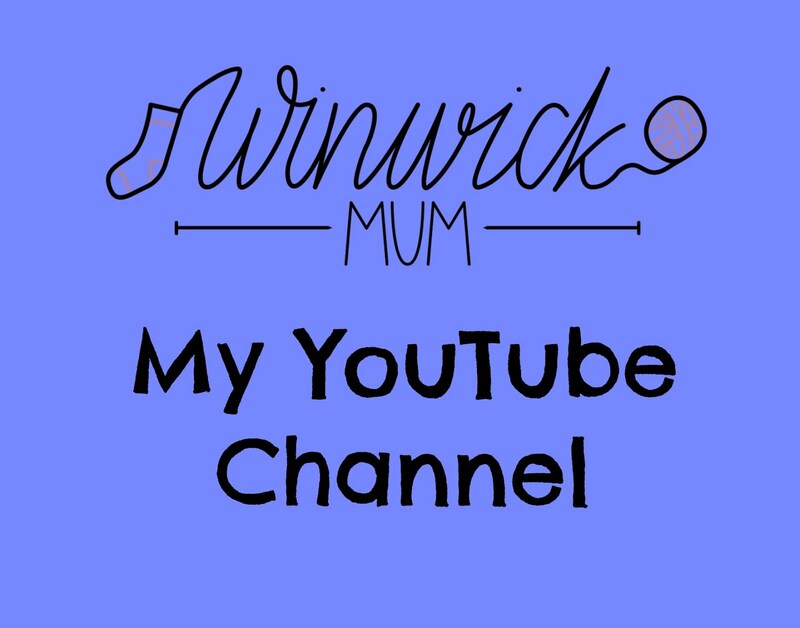 I’ve had such an incredible time and I wanted to I’d share what I got up to while I was away, especially as you lovely people played a big part in getting me there! We flew into Lima after an 11 hour flight. It was very busy and we were glad to get to our hostel for the first night. We only stayed in Lima a couple of nights before we were off on a plane to Cusco. 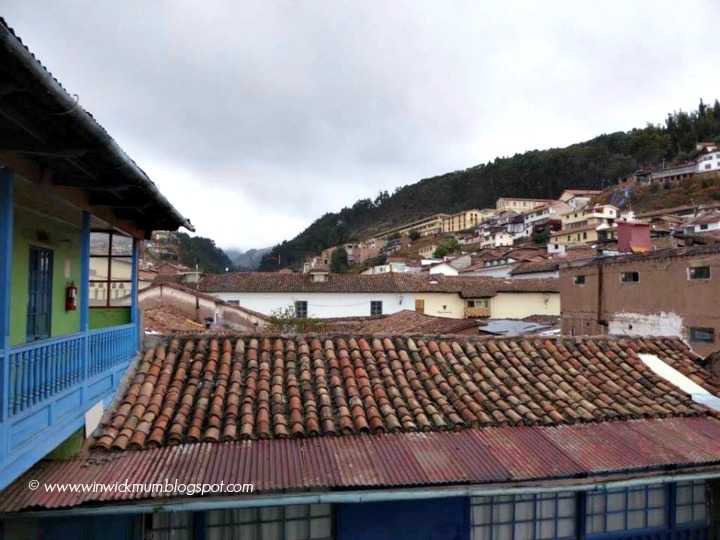 Cusco was our favourite place that we visited, it was full of other back packers and was beautiful. We stayed right next to the main square and at night the mountains lit up with the lights from the houses that were built up the hill - it was like looking at stars. 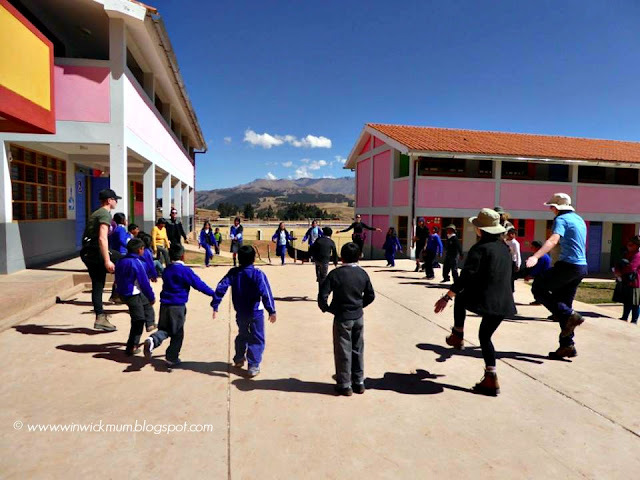 Our first week consisted of staying with a family in a village called Chacan. The food was rather questionable but the experience was absolutely incredible. Our project changed while we were out there and we ended up building waste disposal units. You never really notice the importance of bins but when places to leave your rubbish are scarce then there’s quite a bit of litter around. It’s an amazing feeling to know that we have helped a village thousands of miles away to improve their way of living. We also spent time at a school playing games with the children there. We stayed with a lovely family who took us in and looked after us. This is a picture of the house where they lived. 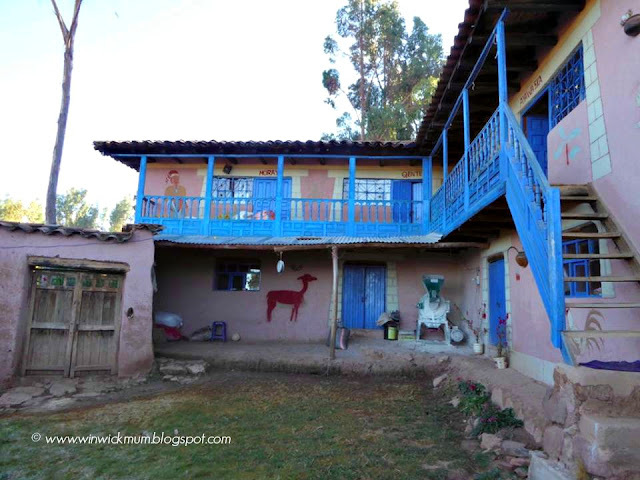 It was very basic and very different even from the hostel in Cusco. 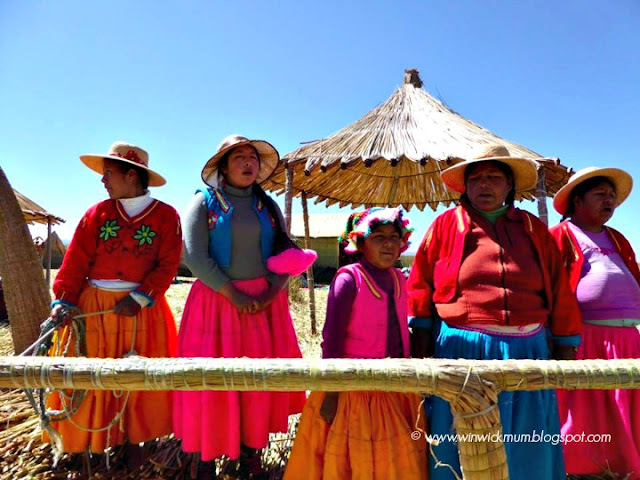 The villagers spoke Quechua which made it harder to communicate - I am now brilliant at charades and am going to beat everyone at Christmas! They welcomed us with a song when we arrived and sang us a goodbye song when we left, which was very emotional. The second phase of our expedition involved trekking through the Andes Mountains. 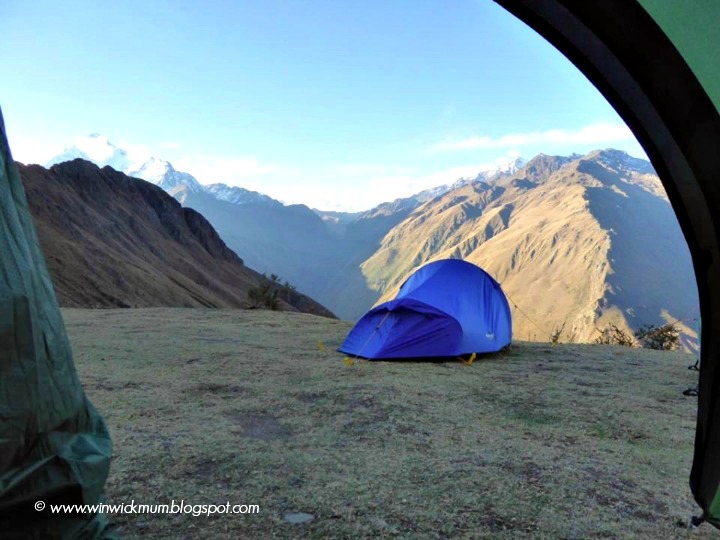 We hiked to 4,500m, which was much more difficult than I imagined it would be. 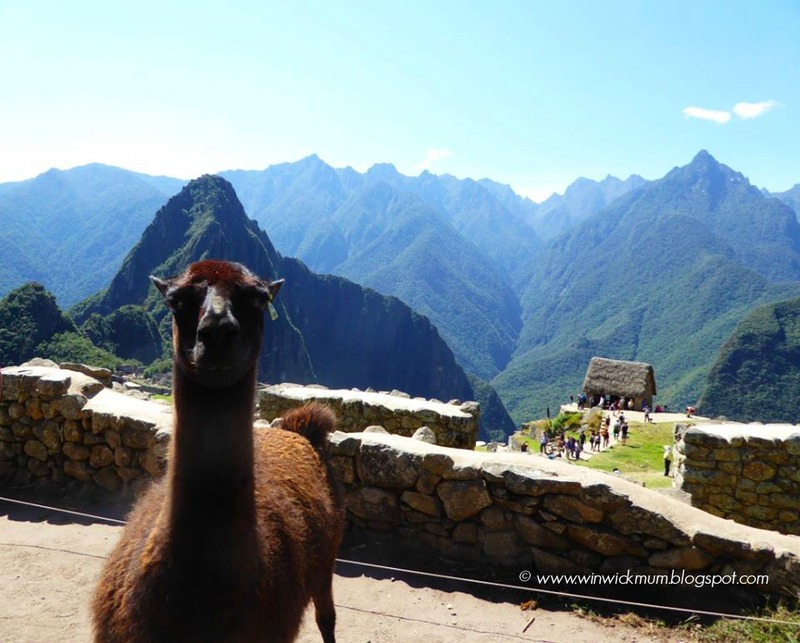 We had to take Diamox to help with the altitude sickness. On the trek, I’d never realised quite how bad my balance was until I had to walk up steep hills and along the side of mountains, my walking poles came in really handy! The pictures I took with my camera don’t give the view justice, the mountains were breathtaking - in more ways than one. Our guide was really good and we learnt a lot about the mountains and the plants while we were walking. 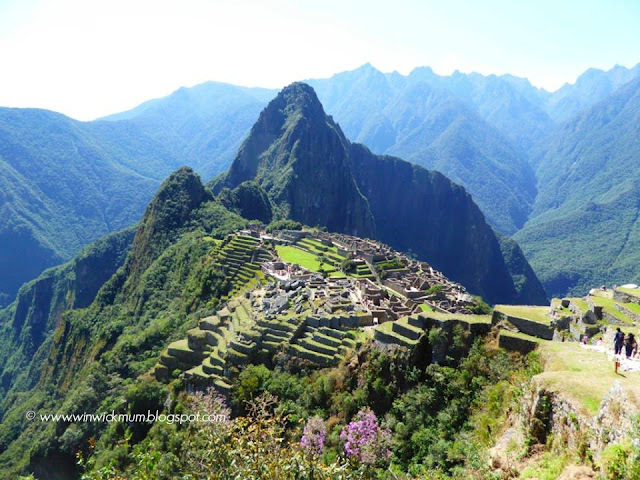 The next few weeks consisted of seeing more of the country including visiting Machu Picchu which was absolutely amazing! 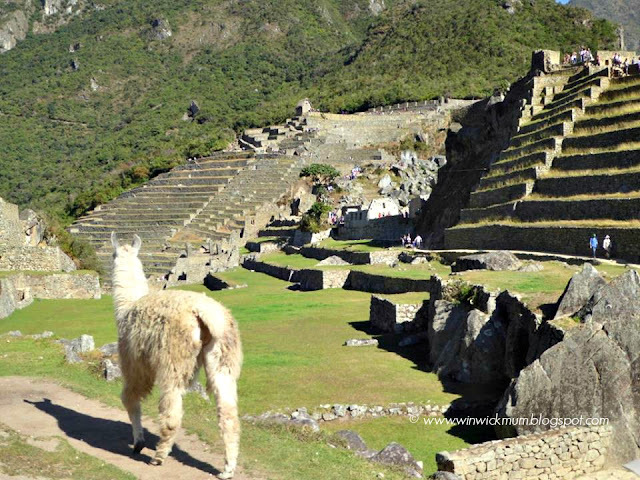 Once we’d made it to the top, and been chased back down by a llama, we had a picnic and played the card game Uno. Walking through the ruins was just something else, words can’t really explain how brilliant it was! If you ever have the opportunity to go, grab it with both hands! White water rafting was also an experience! My bad balance followed me from the mountains but luckily I only fell into the raft rather than out of it! It was incredible being surrounded by massive mountains that I could say that I’ve climbed. The last couple of weeks mainly involved travelling on buses, including a 12 hour bus ride. 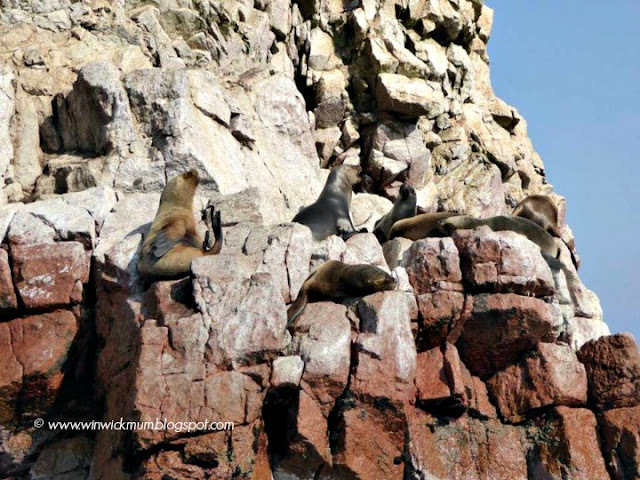 We visited Puno which is where Lake Titicaca is. I was quite disappointed by this place actually - if I hadn’t have been to Chacan and spent time in a proper Peruvian village then I probably would have enjoyed it a bit more. It just felt very touristy and they kept trying to sell us things that we felt obliged to buy. 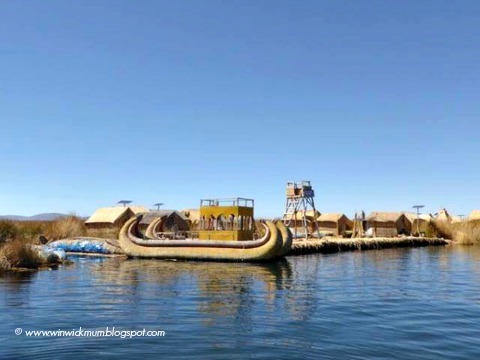 However, the fact that their community was built on reeds was really interesting and we got to ride on a boat that they’d made of reeds, which was much sturdier than you would think it would be. 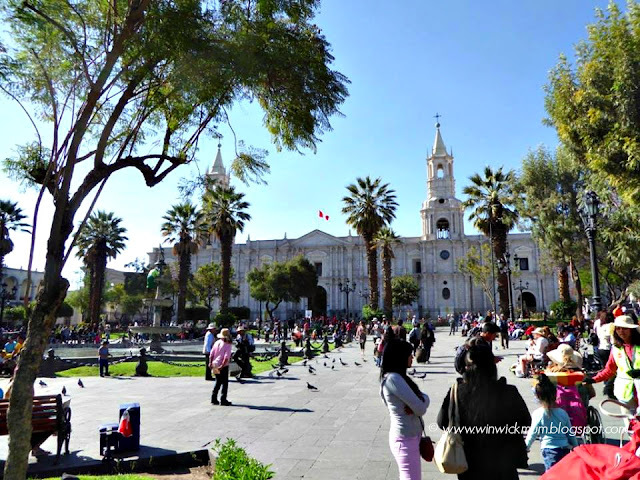 From Puno, we travelled to Arequipa, which really is a beautiful city of white buildings. You can see the Spanish influence in the buildings in the bigger cities. While we were there, we visited a museum and learnt about the 500 year old mummy who had been found up in the mountains. She had been frozen by the weather after being sacrificed by the Incas and all her internal organs were still intact. 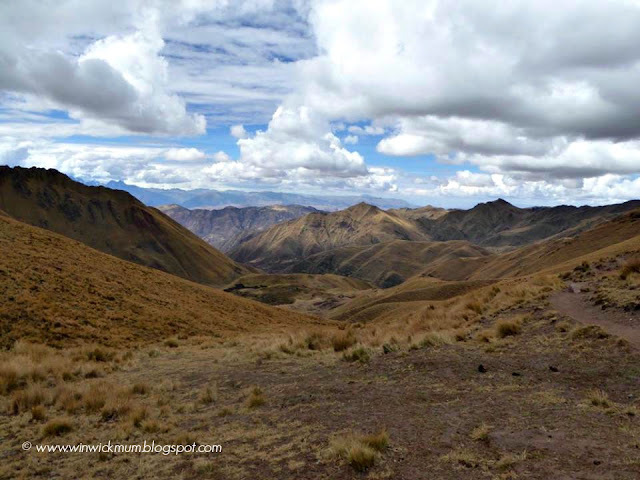 We also went to Colca Canyon which is one of the deepest canyons in the world. 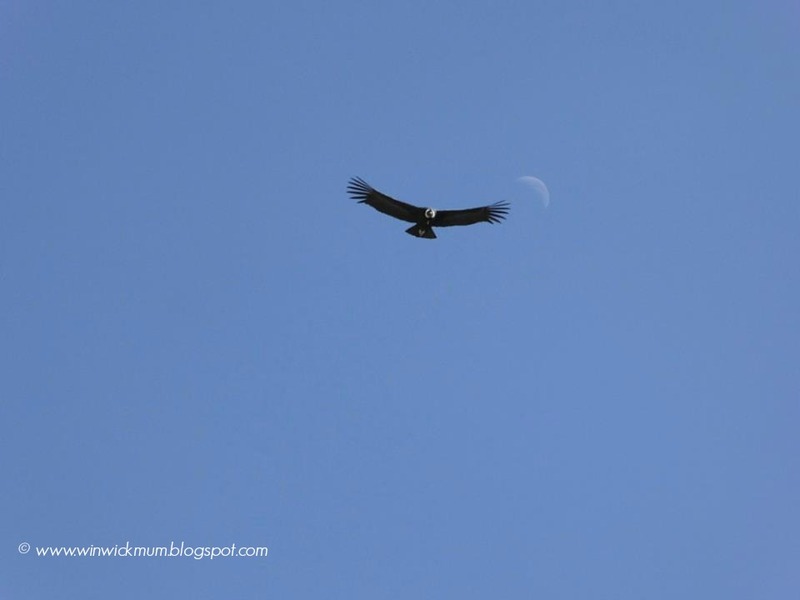 We were blessed with the sighting of a Condor. Condors are a type of vulture and the largest variety of flying birds - they really are huge! On the way back we explored the little villages around the canyon and visited a hot spring. 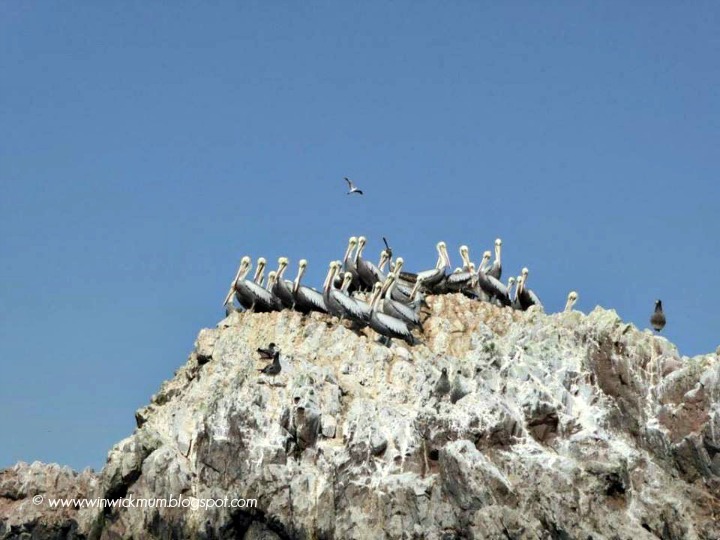 Our final destination was Paracas. 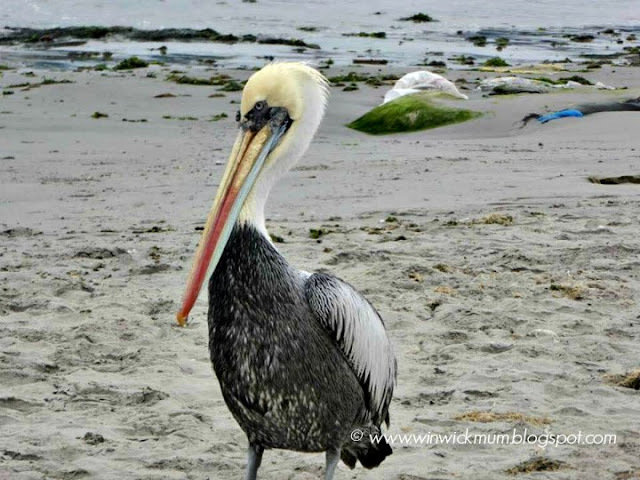 I have never seen so many pelicans in my life! We visited the desert which was full of fossils as it used to be submerged in water. We also went on a boat tour to see the Ballestas Islands, also known as the Poor Man’s Galapagos, which was an island that had been taken over by birds. It was also the home of penguins and sea lions. One of the things that really struck me was the massive difference in how people lived. 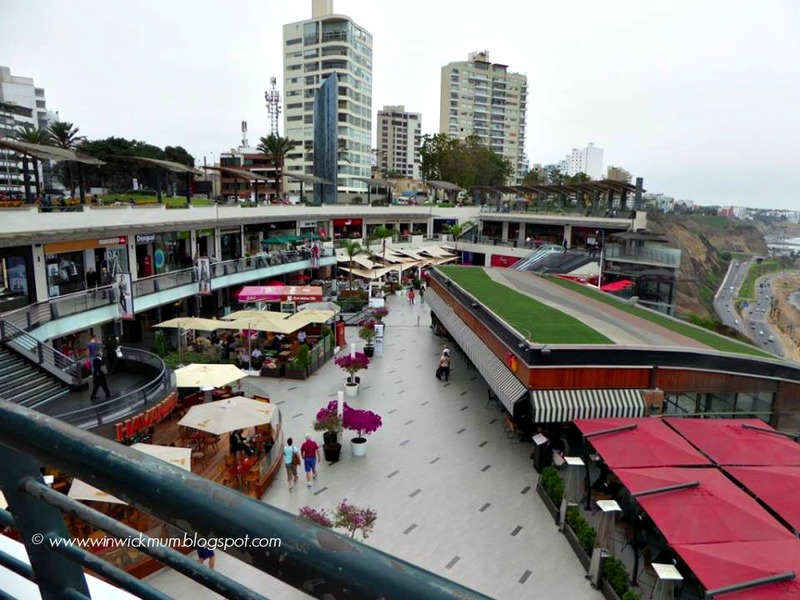 Lima was a built up city very similar to London, but you could drive only 3 hours away and there would be houses made of mud with tin roofs. It definitely changed the way I think about things and who I am as a person, I wasn’t the loudest person before I went away but now I feel much more confident in my own skin. I will also appreciate my Mum’s cooking from now on! Now that we're into August, it's quite amazing how quickly the time has gone since the beginning of June when I started knitting socks for big daughter to take to Peru with her. She was only allowed to take 4 or 5 pairs with her for the whole month that she was away and much to my delight had asked whether some of those pairs could be hand knits. I decided to use it as an opportunity to do some research into British yarns so that she could take a bit of where she came from with her, and whilst I was at it, I decided to look more into the idea of using yarn that didn't contain nylon but instead used a blend of different fibres to create a natural alternative. Just because I could, really - I'm learning more and more about different yarns and how they work and I'm interested. There's always something new to learn! I eventually chose Hebridean Wool with Mohair from Blacker Yarns and you can read more about it and why I chose that yarn in this post. 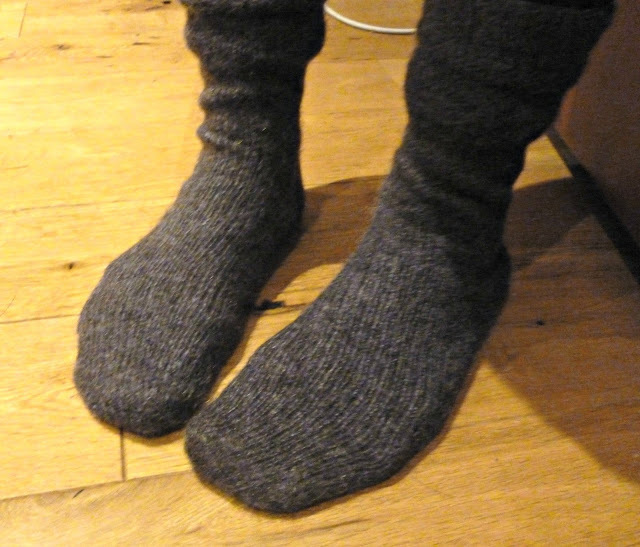 I was able to knit two pairs of UK size 6 socks from three 50g balls with yarn left over for less than the price of one hand-dyed skein of yarn so I was very happy with my choice. Big daughter was very happy with her socks too, and wore one of the pairs to travel in as she made the long journey to South America. I tried not to ply her with too many care instructions for the socks (this wasn't a trip just to trial yarn, after all!) but did make sure to tell her to wash them in cool water and to reshape them whilst they were still damp - this yarn isn't superwash and whilst I think they would probably be all right in a cool wool wash in a machine, I wasn't sure she'd have the opportunity to do that and the last thing I wanted was for her socks to shrink to a size small enough to fit only the nearest llama! When we picked big daughter up from the airport, she was wearing her socks and on first glance once she'd taken her boots off (I wasn't going to interrogate her within minutes of getting her home, whatever the temptation!) they seemed to have survived the trip very well. So, now that big daughter has finally taken them off and I've been able to have a good look at them and ask questions, I'm ready to give you an update on how these nylon-free socks made with Welsh wool and mohair stood up to a month of being worn. This is how the socks looked before she left. The top pair isn't blocked but the bottom pair is. and I also continued the heel stitch down from the heel flap and across the whole sole of the foot to try to make it more hard-wearing and also do what little I could to try to prevent blisters. It's easy enough to do this and it didn't use significantly more yarn so there wasn't a worry about me running out. 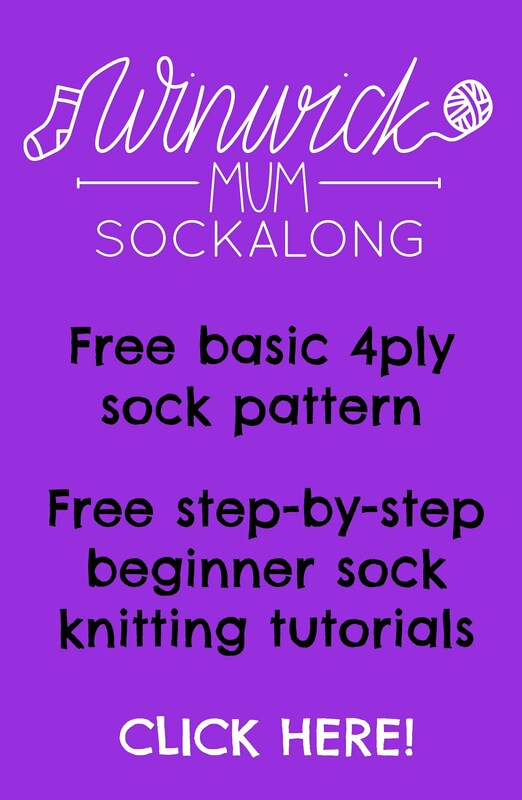 I'm planning to write a tutorial on how I did this in case you'd like to try it on a pair of your socks. This is a close-up of the heel with the heel stitch across the heel turn and down the foot - I don't know how easily you can see it. It made the whole of the bottom of the foot more cushioned and I was pleased with how it turned out, although I did have to remember not to pull the yarn across the slipped stitches and pull the whole sock in tighter. 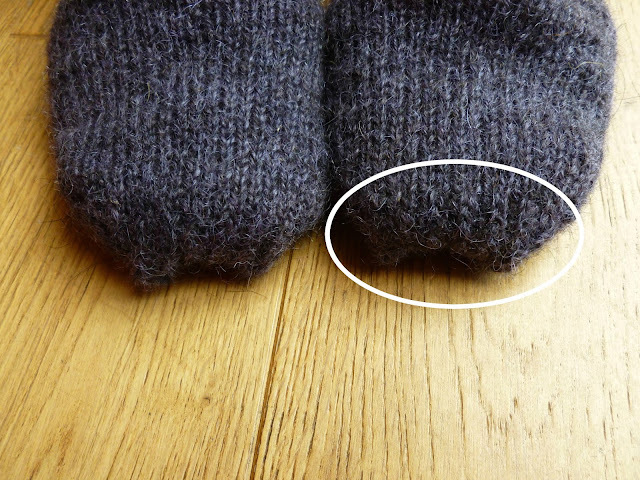 so I've circled the heel stitch in this picture so it might make it easier to see. I wanted to try to avoid big daughter's toes rubbing on her boots if I possibly could. Here are the "after" photos. This pair had been in big daughter's bag for quite some time so they're a bit crumpled but they still look like a pair of socks! This is the pair that we peeled off her feet when she arrived home, and I think you'll agree that they look in remarkably good shape. Big daughter said that they were very comfortable, and she often wore the same pair for a few days at a time before changing them. This was one of the reasons that I chose this yarn, because I was told it had natural anti-bacterial properties and I had thought that the washing facilities might be a bit limited at times! 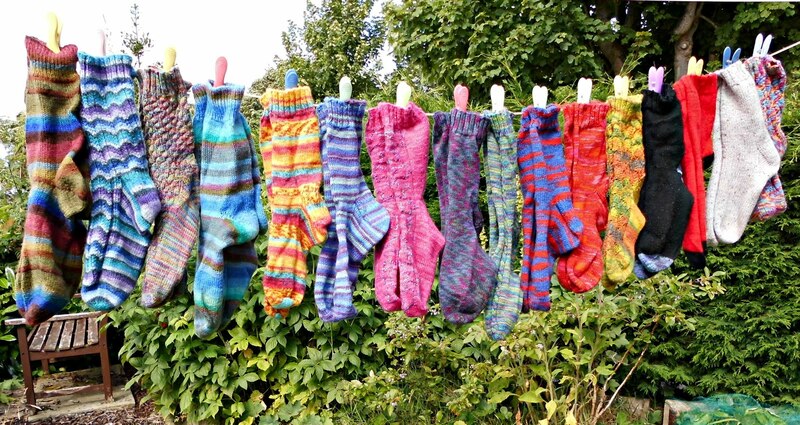 It turned out that big daughter hadn't washed her hand knit socks at all whilst was away, even though she did wash her bought socks. She told me that she kept her clothes at the bottom of her sleeping bag overnight so that they would be warm when she put them on the following morning (especially whilst on her trek and right up in the mountains) and would usually just pull on whatever she had been wearing the day before. 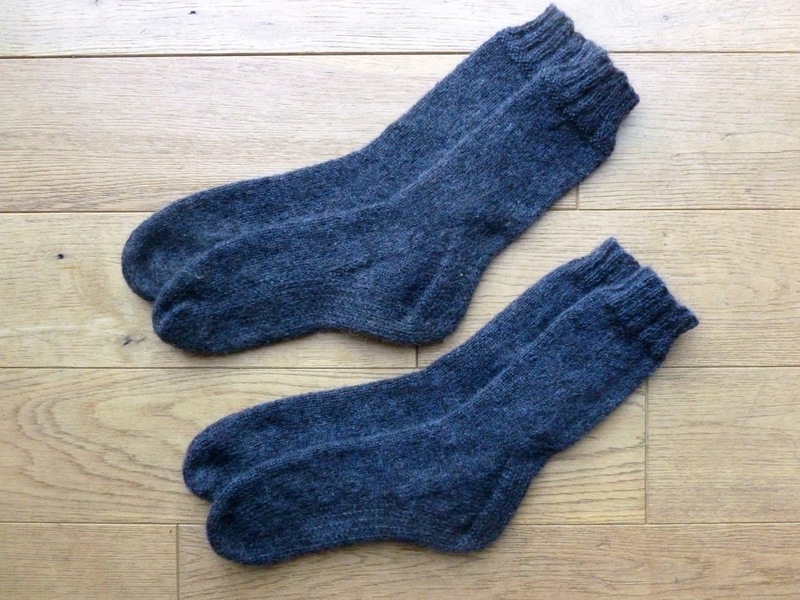 She found that her bought socks quickly became smelly and a bit damp whereas her hand knit socks were good for a few days before she changed them - no smell and no dampness so she hadn't felt the need to wash them. In fact, now that I've got them in my hands I've given them a cautious sniff (the things I do to give you all the facts!) but they don't smell at all. A bit woolly, perhaps, but certainly not as if they've travelled many miles in a pair of boots. There aren't any holes in the socks, no places where they seem to have rubbed thin and no other obvious damage to them at all. They're in remarkably good shape. What has happened is that the yarn has started to full (produce a felted fabric) on the soles where it has been worn. This does happen more with woollen yarns than worsted yarns (there's a good explanation of the difference here) because the fibres in the woollen spun yarn lie across each other and rub against each other with the movement of the garment being worn, hence the fulling, whereas with worsted yarn the fibres all lie in the same direction so that doesn't happen. This yarn is 50/50 woollen and worsted spun so there are fibres in the yarn (which give it it's woolly look) which have rubbed against each other to produce the thicker layer. The sock on the left is one of the crumpled ones from the rucksack and the one on the right is the one that big daughter was wearing. You can see that she's worn this pair more often! which you can see more clearly in this photo. This tends not to happen with the commercial sock yarns that I've used before, presumably because they are totally worsted spun so less likely to full and turn to felt. That's something that's important to manufacturers who produce yarns that be made into garments that will often be thrown into the washing machine along with everything else - the last thing they need is customers complaining that their garments have felted when they were supposed to be machine washable. However, we knew all along that there would probably be limited chances of these socks going into the washing machine (although big daughter did find a launderette in some of the places she stayed) so we were less concerned about that. What was more important for us was a pair of thick boot socks that would protect her feet. 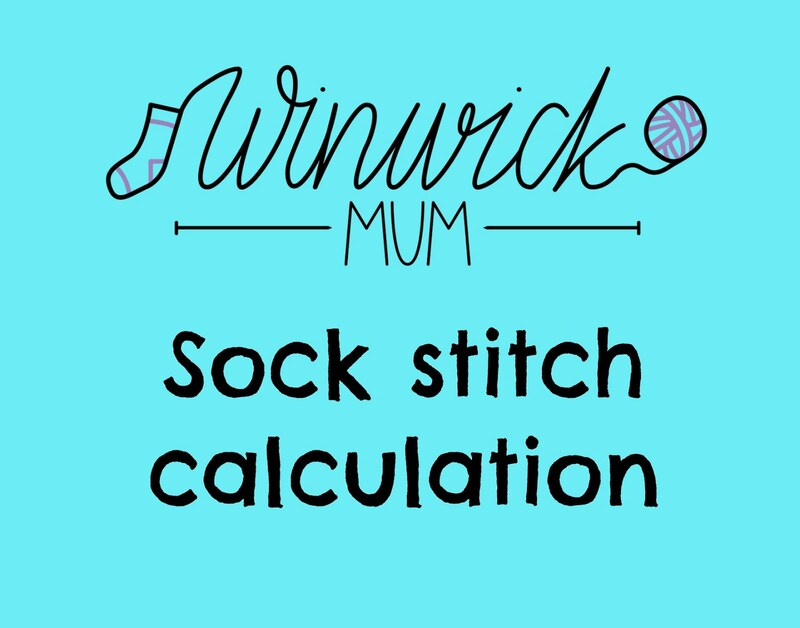 Because the wool has begun to turn into a thicker and even sturdier fabric, it actually made the sock more comfortable and big daughter didn't get any blisters at all. The top of the sock hasn't really changed; you can still see the individual stitches and the fabric has just worn where the extra woolliness was needed most. I thought it might be a good idea to give the socks a wash now that they're home and this is what they look like after they've been washed and dried. I didn't bother to block them again, and if you think that this photo looks very similar to the one higher up the post then you'd be right. I'm quite stunned by how they have sprung back to their original shape, how the fabric is even softer (weeks of wearing have helped with that too) and how the yarn has retained it's shine. I didn't know what state the socks would be in when they came back and I didn't really mind too much as long as they'd done their job - but these socks will continue to do their job for some considerable time to come. Big daughter had no hesitation in saying that she'd put them back on her feet (she'd go back to Peru tomorrow so I guess she'd be glad of them!) and they have worn much better than I ever imagined. 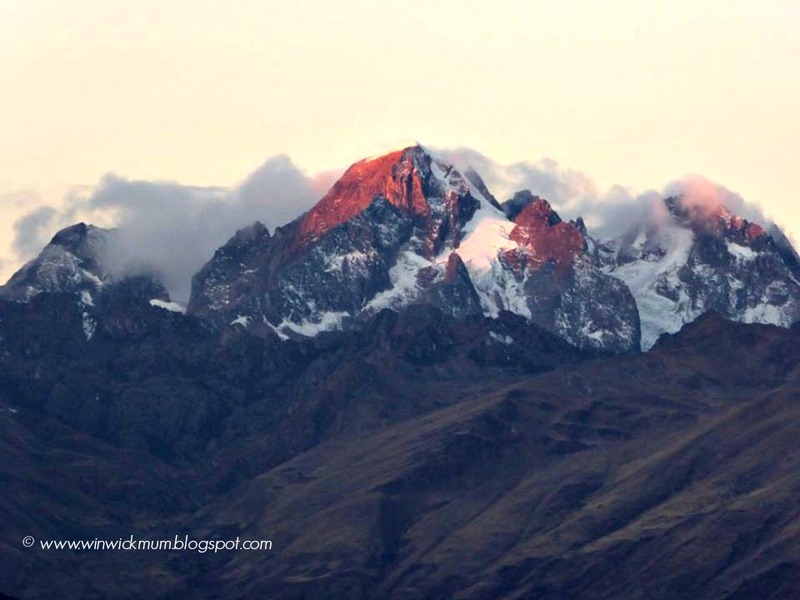 They've been across Peru, walked the 19 miles of the Huarocondo Trek, been up to 4,500 metres and back down again so no easy flat walking going on there and were worn on both flights because they were so cosy. I think that's a pretty good test of the yarn! 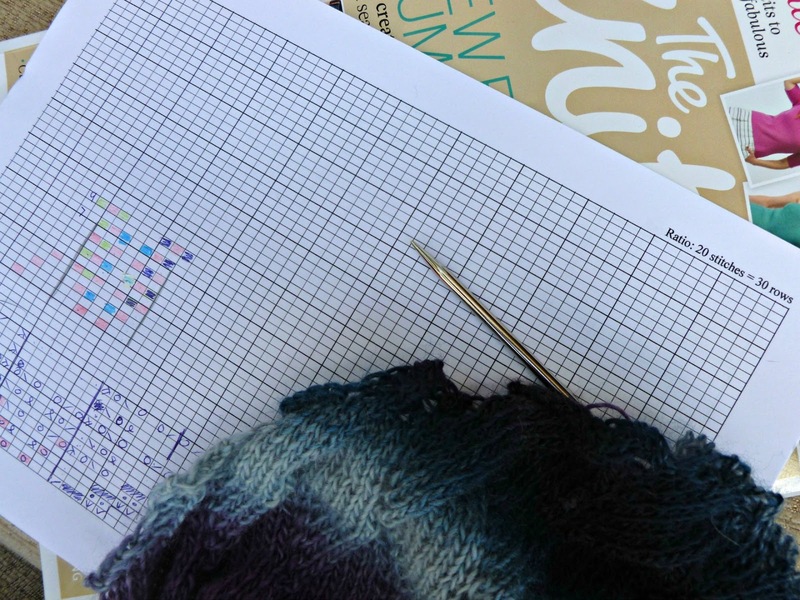 This yarn may not produce the type of socks that you'd choose to wear in your everyday shoes - it's thicker for a start than regular 4ply - but without question I would consider using it again for boot socks. I like that it's grown thicker in places where your feet need the extra support, so I don't consider that to be a problem, and some gentle pulling back into shape whilst they were wet meant that the fabric hasn't shrunk out of shape where the yarn has fulled. I'm really delighted with the way that these socks have worn and I'm also delighted that the skills and knowledge from the farm to the mill have contributed to an experience that would have been much less wonderful for big daughter if her feet were uncomfortable. I'd say that as sock experiments go, this one is definitely a success! 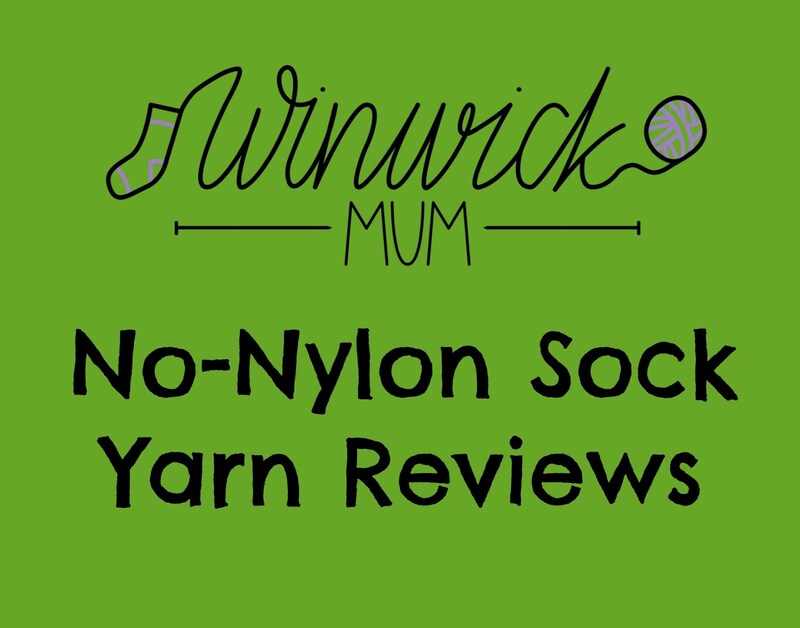 If you are interested in no-nylon sock yarns, you can find my other reviews on the No-Nylon Sock Yarn Reviews page. Oh, it's so good have big daughter back home! She's had a wonderful time in Peru and has promised to write another guest blog post to show you some of her amazing photographs and share some of her experiences - after all, you've played a big part in getting her there by buying the Super Socks and making donations towards her fundraising so she wants you to be able to see her pictures too. We collected big daughter from the airport late on Wednesday evening and it was a joyous, emotional occasion. Waiting for her to collect her baggage seemed to take longer than the four weeks she had been away, and small daughter was doing so much hopping up and down that she was in danger of making craters in the floor! Back home, we were able to continue our celebrations. 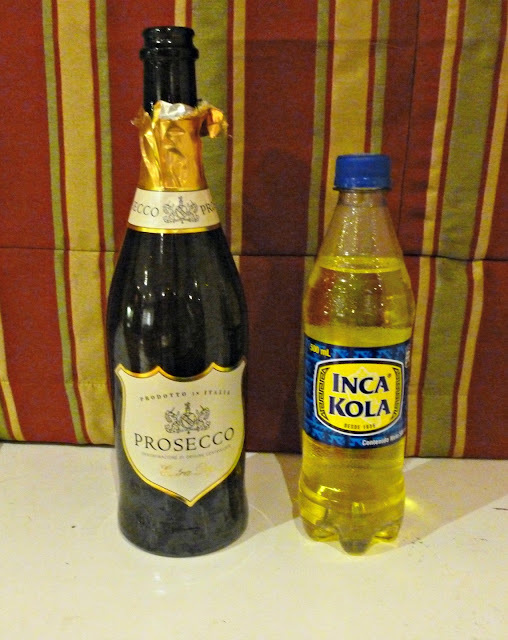 Big daughter wasn't allowed to try any of the local alcohol whilst she was away (World Challenge rules; very wise, given the altitude!) and had grown rather fond of Inca Kola. It's terribly sweet and not something that I think I would choose to drink on a regular basis, but it made a change for the group from sterilised water. Big daughter didn't say no to a glass of Prosecco instead! 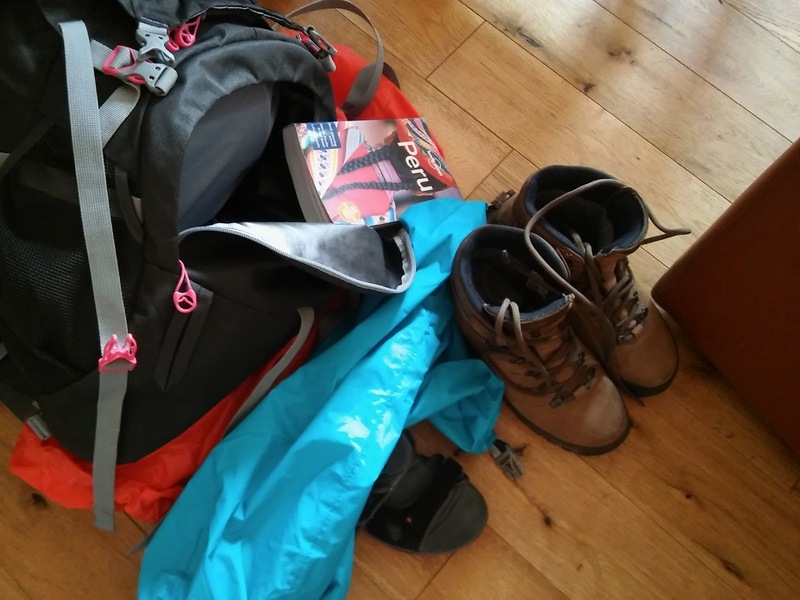 I'm pretty certain that her rucksack had turned into some kind of TARDIS whilst she was away - much bigger on the inside than it looked from the outside - as she pulled clothes, gifts, water bottles, sandals, towels, sleeping bag and travel guides out of it. It spilled all over the table and onto the floor and the dog was fascinated by the unfamiliar smells. And here are the socks! One pair of them anyway (you can see the other pair on the table in the picture above). They've held up remarkably well and I'm going to be writing an update on how they've survived whilst big daughter has been away which I'll post in a day or two. For now, life is just returning to normal. It's harder for big daughter than for us; after all, for us nothing has changed except that our girl has come home. Big daughter has swapped an amazing adventure, a large group of travelling companions and daily excitement for ... normal life. We all get holiday blues after a wonderful trip away, and we're keeping a close eye on big daughter to make sure that she doesn't suffer too badly as she gets used to being at home. I mentioned gifts earlier, and I thought you might like to see what my sweet girl brought home for me. We'd been joking for months about how she should leave all her clothes behind and just bring a baby alpaca home in her rucksack (what an interesting experience at customs that would be! ), although of course before she left I made sure she knew that what was important was that she came home in one piece, never mind the gifts or the baby alpacas! She brought home the closest to our joke that she could. 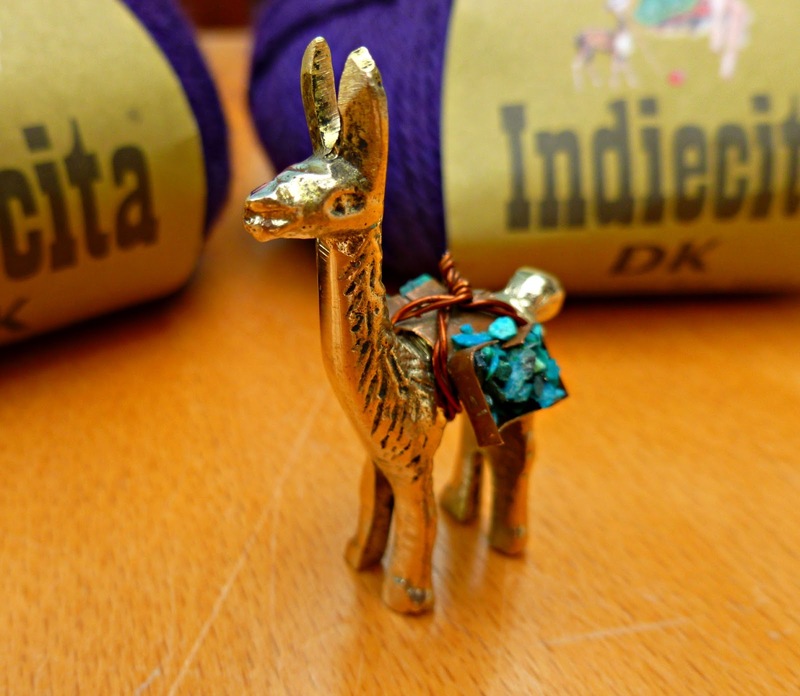 Baby alpaca yarn in my favourite colour, and a "lucky llama" which she bought for me at a local market stall. And she came home in one piece. It's all good. and your girl is back home from Peru before you know it. There are stories to be told, photos to be seen and unpacking to be done. First though, time together and sleep to catch up on. It's good to have her back. We spent last weekend in Wales at a family wedding. It was a whole weekend of families, parties and being away from it all, and it was lovely. The church was tucked away from the bustle of the town, with wild flowers growing in the borders and an air of simplicity about the place that often says more than heavy religious decoration. and the sun shone as we made our way to the hotel where the wedding breakfast was to take place. More simplicity: home made lemon curd to mark seating places. It suited the bride and groom very well, and we were very happy to be part of it. We rented a sweet little house just outside Mold, where the wedding was taking place - only a short drive away rather than the hour or so that it would be from Winwick - and looked out onto this view as we woke up in the mornings. Isn't it nice to see cows? There aren't any where we are in Winwick so it makes a nice change. On the Saturday, we had some time to ourselves before meeting up with the family again, so we took ourselves into Mold to have a look around. It was market day, so we loaded up with local bread and teacakes and a few other bits and pieces. Then I spotted the yarn shop. Small daughter and my husband said they would meet me later. What a find this place is! This is the rather wonderfully-named Yarn O'clock, a lovely little shop on Earl Road run by Anne Aukland, who used to work for a larger yarn store in Chester which has now relocated, giving her the opportunity to open a yarn store of her very own. Yarn O'clock has been in business for four and a half months now, and is well worth a visit if you are in the Mold area. Anne really knows her stuff too, so is happy to help whether you need advice on choosing yarns or with knitting problems. It's a place where you could quite happily sit and knit for quite some time! 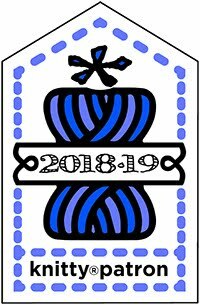 Anne's aim is to stock mostly British and Welsh yarns - West Yorkshire Spinners, Rowan, John Arbon and Fyberspates amongst others. Her aim is to offer a different range to other yarns that can be purchased locally, and her choice of brands is excellent. 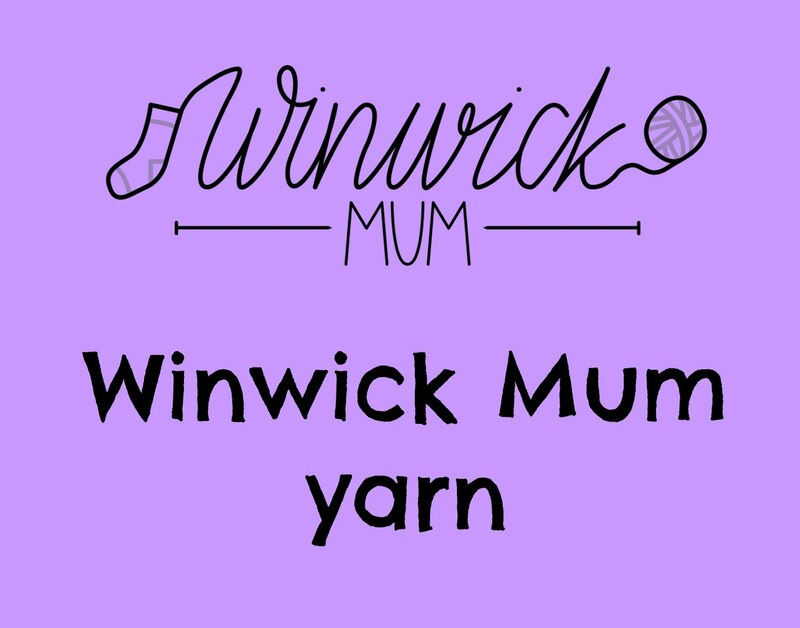 Anne is also in contact with a local alpaca farm and has already started selling their yarn, and has her own range of Yarn O'clock hand-dyed yarns which were specially dyed for her by fivemoons yarns. By this time, (some considerable time later, actually!) small daughter and my husband had got fed up waiting for me and headed to a cafe for some lunch. I got a text telling me that my cup of tea was going cold, so I had to say goodbye and hurry to meet them - not without paying for my yarn first, though! I simpley can't resist these sea glass colours this summer; this is linen lace yarn, a blend of baby alpaca, silk and linen and will need to become a shawl at some point ... must knit faster! and about time too, considering that I started these back in May! His preference is always for black socks (which may explain why they get left ...) with coloured heels and toes. I use leftovers for those - this time he chose the sparkly pink Sparkleduck yarn that I used for my Twinkle Star socks (he doesn't believe in "boy" colours!) and I used a short row heel rather than my usual heel flap. These are what he calls his "proper" socks; I've been knitting them for years for him and he much prefers to wear these socks than any others he has. Black socks finished, it was time to turn my attention to something a bit brighter. These socks are for the Yarndale Sock Line and I'm knitting them in West Yorkshire Spinners yarn in the shade Tequila Sunrise. There was a summer house in the garden where we were staying, and we spent a happy hour or so in there with the newspaper, mugs of tea and sock yarn. Back home again, the sun has continued to shine through the rain showers. The grass really needs cutting but as soon as I get ready to go out it rains, so it's very quickly starting to look like a field again. I'll be spotting cows in Winwick after all soon! The hanging baskets are appreciating the rain, though. I'm never terribly good at remembering to water them so always fill them with geraniums which are much more forgiving than other bedding plants. The red blooms look fabulous with the white star jasmine (Trachelospermum jasminoides) which smells divine whenever you set foot out of the front door. The Yarndale socks are coming along nicely, and match my Herdy mug very well J.
I've also been working on this - it's a pattern called Exmoor by Anniken Allis which I spotted in the The Knitter magazine this month. It called for a ball of Zauberball and it so happened that I found one in my stash when I was hunting through. I am never going to knit socks from the Zauberball as they wouldn't match, so using it for this shawl project instead is ideal. It's not overly complicated but does require a bit of thought as the rows are getting longer, and that makes a nice change from the simplicity of the plain rounds of the socks. Big daughter comes home today; I've been tracking her plane over the internet (isn't it marvellous that you can do that!) and we can't wait to see her at the airport. I'm finding it quite hard to settle to anything today, so I do hope this post hasn't seemed too disjointed! I'll be letting you know how she - and her socks - got on!